What better way to thank Dad for all the awesome work he does than with donuts?! 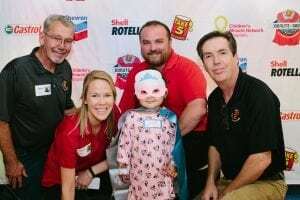 Members of Take 5’s regional leadership team and corporate office joined patients and families on Friday, June 15 to host a “Donuts for Dad’s and Other Superheroes” event. The time was spent celebrating those who support their children on a daily basis with donuts, coffee, arts and crafts, photos with a themed step-and-repeat as well as a swag bag for all attendees courtesy of Take 5 and their corporate partners. This was the first event of this type taking place at four CMN hospital locations across the country. Children’s Health is proud to have been selected by Take 5 to host this inaugural event. Take 5 is currently hosting a donation drive with the goal of raising $500,000 by June 30 for CMN Hospitals. At all Take 5 Oil Change locations in the Dallas area, customers may add between $1 to $5 to their bill, which is then donated to Children’s Health.